SAULT STE. MARIE, MI – Jan. 30, 2019 – Four Rounds of Qualifying for the 51st Annual International 500 Snowmobile Race are completed. 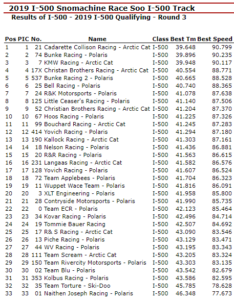 The Top Five remains the same with the Cadarette Collision Racing #21 / Arctic Cat – Snowmobiles machine driven by Troy DeWald, is still on top of the charts with a 39.648 = 90.799mph. 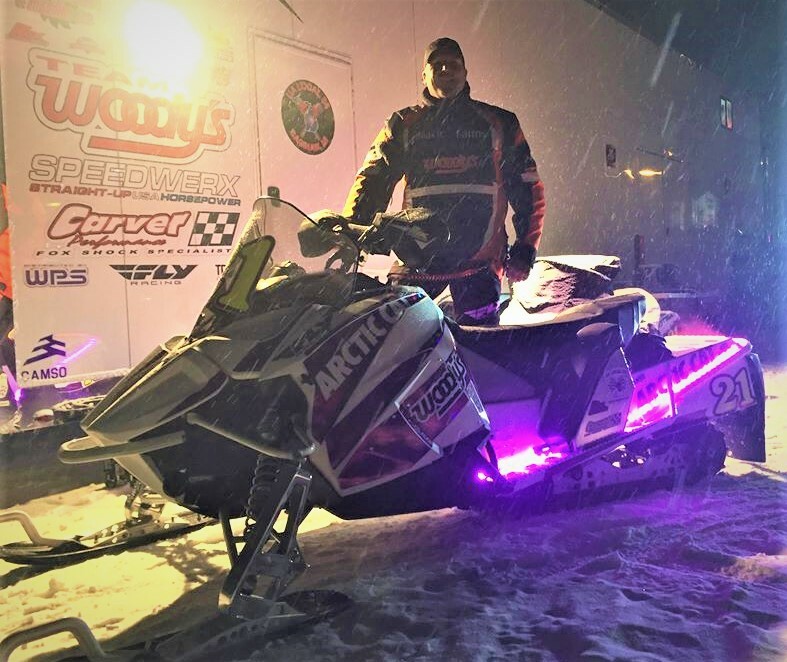 Seven-Time International 500 Snowmobile Race Winner, Gabe Bunke is still second quick as 19-year-old rookie, Luke Krentz, defending #SooI500 Winner, Zach Herfindahl & Ryan Faust complete the top five. The Final Two Rounds of #SooI500 Qualifying are on Thursday, January 31 at 12:00 & 4:15p.m. Earlier in the day, it was Round II of Woody’s Challenge Qualifying and the top spot remains the same with G. Bunke. 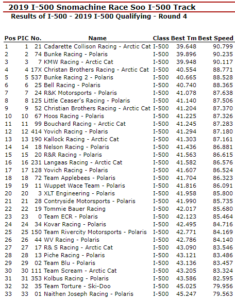 The 42-year-old rider from Roseau, MN still sits on top of the charts on his #74 Bunke Racing / Polaris Snowmobiles machine with a 39.942 = 90.131mph. Krentz is second quick as Two-Time Defending Race Winner, DeWald, Herfindhal & 2004 I-500 Winner, Cory Furkey completing the top five. Final Round of Woody’s Challenge Qualifying is on Thursday, January 31 at 3:15p.m. The Top 16 overall riders will be locked into the 25-Lap Feature paying $1,000 to Win. 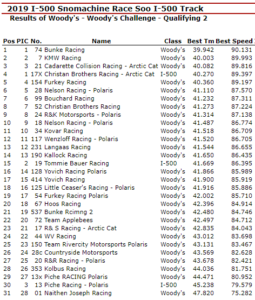 The 24th running of the Woody’s Challenge will take the Green Flag at 7:30p.m. Unfortunately, unfavorable track conditions as well as visibility issues due to snow showers & resulting snow dust forced International 500 Snowmobile Race & Great Lakes Antique Snowmobile Series (G.L.A.S.S.) Officials to Cancel the 3rd running of the Brad Redman Memorial. The Three Features will not be made up due to a packed schedule for the rest of the 51st Annual International 500 Snowmobile Race Week. 1230 WSOO will have local radio coverage on Race Day Only (Saturday, February 2).